One of the things I find most remarkable in today’s society is the demand for others to conform to their perspective rather than allow others to have a different view. This is evidenced in the demand for a so-called ‘living wage’ to those who contribute little or nothing of economic value of the businesses they work for. There is a demand for government to become society’s caretaker through welfare, social security, healthcare, and a vast array of other tax-subsidized programs in the name of social justice. And there are demands that all religions conform to modern societal views that are highly contradictory to long established doctrines and practices. It is upon this last point that I wish to focus my thoughts today. I came across an op-ed in the Salt Lake Tribune written by Don Gale that demands that The Church of Jesus Christ of Latter-Day Saints (aka Mormons) reform its views on 1) the shame of gay/lesbian prejudice, 2) the neglect of education, 3) the tragedy of fundamentalist polygamy, and 4) the hypocrisy of the Word of Wisdom. 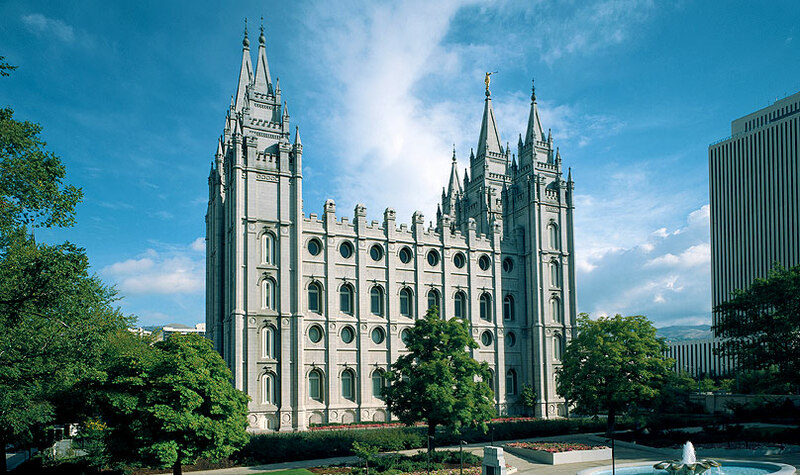 If there is any faith in the world today that appears to have a doctrinal foundation against the religious implications of legitimizing homosexual relationships, it is the LDS church. It’s emphasis on the family as the fundamental unit of society and the strengthening of familial bonds as critical to one’s eternal salvation is one thing that so many have found to be the primary drawing factor toward joining the faith. As the homosexual movement was gaining steam and becoming a more significant voice in the national media in the mid 1990s, the church saw fit to issue a formal proclamation to the world on the family. This document, among other things, reemphasizes several core points of doctrine within the LDS faith – That every individual has an eternal gender identity, that families are meant to enjoy eternal bonds, that one of the first commandments to mankind was to multiply and replenish the earth, that all life is sacred, that husband and wives have a solemn duty to provide for the physical and spiritual needs of their children, that happiness is most likely to be achieved through the family unit, and that all those who violate God’s commandments will eventually stand accountable before God. The effect of shame is something that is not lost on me. My own personal challenges have led me to struggle with my faith. I am fortunate in that this struggle has been largely private. I haven’t been mocked, ridiculed, or scorned by anyone I have encountered when I have had the courage to reveal my challenges to them. However, this doesn’t mean that I haven’t wondered at my own standing and accountability to a higher power, if such a power exists. But I do know how hard it is to attend a meeting when my own personal challenge is described as sinful, denigrating to my spirituality, and a barrier to my enjoyment of God’s blessings. But one of the fundamental teachings and strivings of humanity is to overcome our own humanity and become something more. I think you find this regardless of religious affiliation. The natural inclinations of mankind is not really all too different from the rest of the animal kingdom. There is the very real desire and need to procreate. This primary need can be superseded by another need to find acceptance and the gratification that is enjoyed by a completely devoted relationship with another single individual. However, as a society, we have sought to subjugate our baser desires for procreation to a higher order of monogamy. In large part, monogamous relationships are a key contributor to mankind becoming what it is today from an evolutionary standpoint. Monogamy allows for trust between partners and often demands that personal wants and desires be placed second to the needs and desires of one’s spouse and children. Making such sacrifices is hard, and is the primary reason so many marriages fail. But such failure is hardly a reason to abandon such institutions. All of this is to say that the inclinations we are born with provide an opportunity to demonstrate mastery of self. We take those inclinations and tell them that they are not our masters. Any range of vices could be listed from pride, to selfishness, to vanity, to a quick temper, to gambling, to smoking, to alcohol, etc. Within the scope of the LDS church, there is a demand of mastery of our sexual appetites. Masturbation is discouraged and described as self abuse. Chastity is required until a man and woman enter into the bonds of matrimony, and then absolute fidelity only to one’s spouse is demanded. Homosexuality is no different in that it provides an opportunity to show God that one’s baser inclinations do not supersede one’s desire to abide His commandments. Of course, there is shame in the knowledge that one is in violation of God’s law. But this shame presents an opportunity either to turn toward Christ’s love and the power of his atoning sacrifice or to turn from it. Mr. Gale makes the assertion that such positions and doctrinal teachings against homosexuality can change as attitudes towards polygamy and the bestowal of the priesthood to Americans of African descent changed. He further asserts that there is no doctrinal foundation for a stance against the practice of homosexual unions. The doctrinal gymnastics that would have to be performed to legitimize homosexual relationships within the church are something that would truly be something to behold. Love and sexual relationships are not exclusionary; however, sexual relationships and obedience to God’s Law are certainly exclusionary at points. Prejudice is not a teaching of the LDS faith, but is a human reaction to that which they view as different or a threat to their current world view. Hate and scorn have never been acceptable in the eyes of Christianity. Christ’s paramount commandment was to ‘Love one another as I have loved you.’ As we are all sinners, we all need to exemplify the Christ-like attributes of forgiveness, compassion, and understanding. But forgiveness has never been condolence. The ultimate point is to overcome sin through the redemptive sacrifice of Jesus Christ. There are times when people say things about the LDS faith that make me wonder if they have ever been to a church meeting or watched any of the semiannual conferences that the church puts on each year. The problem here is that Mr. Gale cites only an anecdotal observance of a decline in the number of talks given on education and says that elected officials seem to fear education. While education can indeed create a wedge in one’s faith, it very often has the impact of being a support of that faith. “You are moving into the most competitive age the world has ever known. All around you is competition. You need all the education you can get. Sacrifice a car; sacrifice anything that is needed to be sacrificed to qualify yourselves to do the work of the world. That world will in large measure pay you what it thinks you are worth, and your worth will increase as you gain education and proficiency in your chosen field. The counsel to be educated is one that is repeated in any number of talks. I cannot think of a single instance in which I can ever recall a church leader advising to not seek out as much education as possible. Nor can I ever remember a church meeting I attended where the proposition was made to do anything but to learn as much as possible. Continual self-improvement, a premier tenant of the LDS faith, is something that can be achieved only through awareness of one’s deficiencies. Awareness can only come through education. To say that there is any lack of an emphasis on education in the LDS faith exhibits nothing but pure lunacy. Mr. Gale also cites a lack of support for education on the part of the tax payers. Perhaps he is unaware of the fact that the vast majority of Utah’s State Budget goes toward funding education – 50.4 % of the state budget dollars went to funding public education and 15.5% went to the funding of higher education for a total of 65.9% of the state budget going toward education. This data comes from the Statue Budget Report for the fiscal year 2012, page 14. Individual student performance in Utah is generally higher than in the rest of the United States indicating that while Utah has one of the lowest per student spending numbers, it is making effective use of those dollars and having a high number of well-performing students according to the 2012 annual report released by the Utah State Office of Education. There is no direct correlation between educational spending and outcome as is demonstrated in this infographic. The US is the obvious winner when it comes to educational spending, but falls into the lower tiers among the 10 countries listed when it comes to performance in math and science. If any reform is needed, it is to stop subsidizing teacher unions and create higher standards of teacher and student accountability. Students need to be taught how to think, not just how to fill out the right bubble on a multiple choice exam. First of all, the fundamentalist polygamous groups are a break off of the LDS faith, not an actual part of it. When the church reformed its practice of Polygamy, there were those who claimed that the decision was misguided and showed the apostate nature of the church as it was established by Joseph Smith. They are not officially part of The Church of Jesus Christ of Latter-Day Saints. Considering this lack of affiliation, one can only wonder how much influence church leaders might have had against the enforcement of law against the travesties that have and do occur in these communities. In speaking of cases where Texas had to make up for any of Utah’s deficiency in the legal practice, I can only assume that he was referring to the case of Warren Jeffs. Again, this was the legal system, which is fallible that made a mistake when improper jury instruction was given leading to an overturning of conviction by the Utah Supreme Court. The right to a fair and speedy trial is fundamental to the fabric of the United States. Unfortunately, human error is often committed in the legal process, and the law is forbidden from persecuting the same person for the same crime more than once under the defense of double jeopardy. I am not certain what influence Church leaders could have had in this legal proceeding. Mr. Gale falls victim to the same fallacy that so many both inside and outside of the church come to when it comes to the counsel of the LDS church to not drink coffee. They assume that it is because of the caffeine, when any specific ingredient in coffee and tea is never mentioned as the Lord’s reasoning against these beverages. However, in coming back to the concept of self-mastery that I touched on earlier, one can see why this implication is made. While anecdotal, I don’t know personally how many times I’ve heard someone make the exclamation that there is simply no way that they could function without their morning dose of coffee. Of course, they may be speaking hyperbolically, but they are still speaking to the truth that there are addictive substances in the world and coffee happens to be one of them. Cigarettes and chewing tobacco are much the same way. Indeed, there also seems to be an epidemic of compulsive eating in the United States today that is contributing to the nation’s climbing rate of obesity. The word of wisdom to be mindful of what one chooses to ingest is not one that has lost any of its effectual power. The church’s doctrine of repentance and self-improvement are not ones that have become outdated. On the other hand, we live in a highly indulgent society. There is little doubt that there is an epidemic of instant self-gratification. As a society, we are driven to consume and then throw away anything we no longer see as having any value. Commercials on television attempt to convince us of all the reasons that we need this or that. Programming on television teaches us that we must satisfy any and all indulgences without question as to the consequences. Entire tax-payer organizations exist to support those who think that the ramifications of their sexual activity could ever result in a pregnancy should be avoidable. Our healthcare system is one that now mandates that insurance provides coverage of contraception whether you need it or not. Mr. Gale tries to make the point that reform is needed, and in a sense, I agree. Reform is needed, but not on the side of a major religious organization. If reform is needed, it is in the awareness that just because society is leaning a certain way, it isn’t necessarily the right way. If reform is needed, it is to reform the view of the family as the fundamental unit in society rather than the government. If reform is needed, it is in the avenue of the promotion of self-master rather than self-indulgence. Education shouldn’t simply advance the presentation of facts and figures, but must foster curiosity and teach critical thinking. Strong religious views and morals are much of what contributed to the greatness of the United States. It would be a shame to throw that away as our society is wont to do when It becomes bored with something.